Today I received the email I have been waiting nearly a year for. It was from Darren in the Workbench Group at Lie-Nielsen Toolworks, Inc. 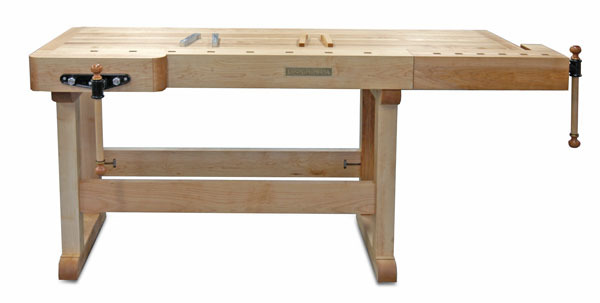 I ordered the Lie-Nielsen Workbench nearly one year ago and have been anxiously waiting for it since. Today Darren informed me that they will be starting my bench in a few days. That was the good news. The bad news is that the price went from $2,000 to $2,500. It seems oil prices have found their way to Lie-Nielsen Toolworks too. But hey, I didn’t flinch. I said “Here is my credit card number, when can I pick it up?” Darren probably wished he told me the new price was $3,000 and pocketed the difference, because my voice must have told him I would say yes to that too. You are probably wondering why, at $2,500, I don’t build my own workbench. I considered that very seriously. I bought nearly every woodworking book with the word bench in its title and read them all cover to cover. I even have a signed copy of Chris Schwarz’s popular Workbench book. 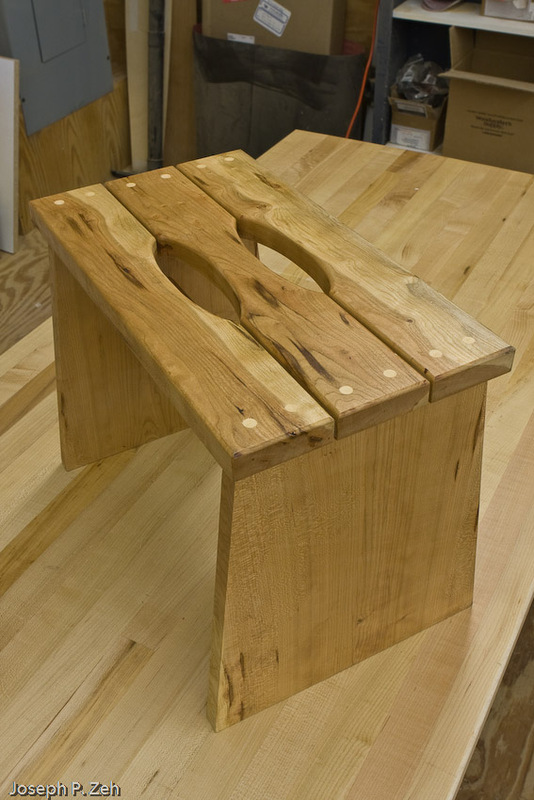 In fact, at one point I had decided to cancel my order at Lie-Nielsen and build the Roubo bench. Chris’ book is very compelling. But in the end I stayed with the Lie-Nielsen bench. 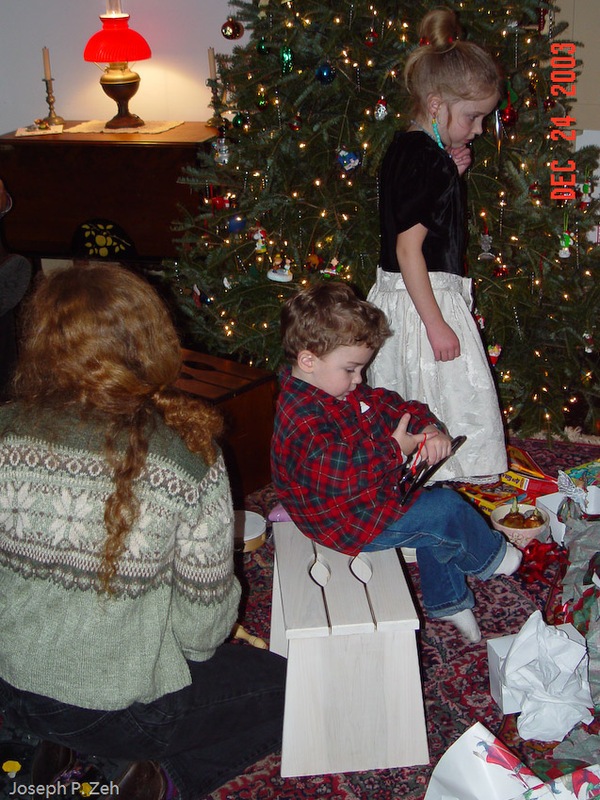 My reasons were threefold. First, building a bench would mean building one less piece of furniture. I am often faced with this tradeoff when it comes to fixtures, jigs and tools. Furniture almost always wins. 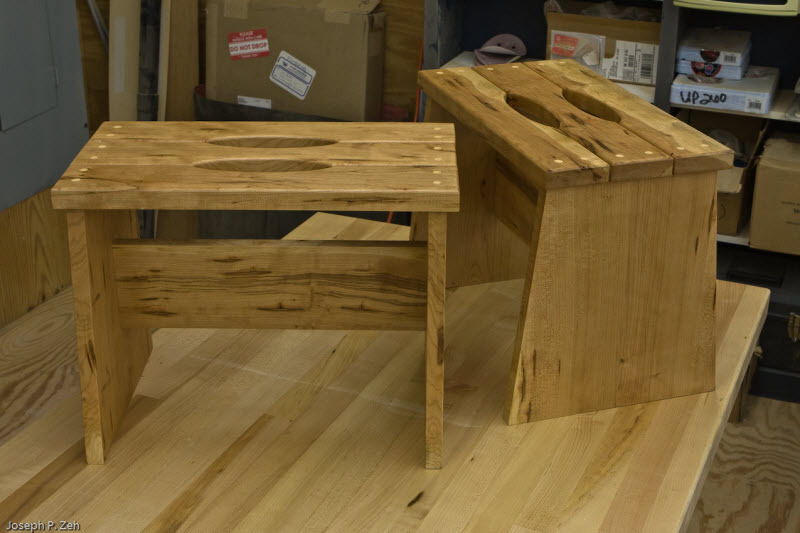 Furniture is what I love to build, and if that is not reason enough, all I need do is look at my Honey-Do list to convince me I haven’t the time to build a workbench. Secondly, gluing up the top and flattening it is almost a different branch of woodworking; one I am not prepared to take at this time. Lastly, I have a large number of Lie-Nielsen tools. All of them are quality tools that I love to hold in my hands and work wood with. I am betting I am going to feel the same way about this bench. That of course does not address how I rationalized the choice of the Lie-Nielsen Workbench over the Roubo. They are after all very different benches with very different purposes. It boiled down to what I do most, which is hand cut dovetails. The Roubo excels at jointing the edges of wide and long boards. The shoulder vice on the Lie-Nielsen is ideal for cutting dovetails. It was that simple. However, I have a workbench (which I did build myself) that I currently use for cutting dovetails and assembly. It is heavy and sturdy. Once I receive the Lie-Nielsen I am going to retrofit that bench with a leg vice and holding devices similar to the Roubo. So I will have the best of both worlds. Delivery of the Lie-Nielsen could not come at a better time. If you read previous articles on this blog you are aware I am building a wall hanging tool cabinet for my hand tools (mostly Lie-Nielsen). Ahhh! You think you have caught me breaking my own rule about building benches, tools, fixtures or jigs verses furniture. Well no. It’s just that I couldn’t find a commercial solution and my tools have been waiting seven years for this storage. But that’s a regression, back to the timing of the delivery. My workbench and tool cabinet will be joined at the hip, that is, they go hand in hand and will take up a whole corner of my shop, which needs serious rearrangement to fit them. Best I do it all at one time. My tool cabinet will be completed about the same time the workbench arrives. I will keep you updated on both my tool cabinet and the workbench. After using the latter for a while I will post a review. Stay tuned. My projects always start out the same – realizing my idea by sketching and designing it in 3D, then producing shop drawings complete with a cut list. Having done that I am ready to go into the shop and prepare my stock. My current tools of choice for this task are Google SketchUp for 3D drawing and CutList Plus for producing a cut list and parts list. These two tools do not naturally speak to one another, that is there is no export or import utility supported by either application that allows them to pass design information between them. However, SketchUp has a Ruby API and development console that allows third parties to produce scripts that can be used by SketchUp to extend its functionality. Most of these Ruby scripts are written by software developers, or wannabe software developers, and they are provided to you for free. To use a script you simply download a simple text file with an .rb extension. The file must then be placed in the appropriate SketchUp Plugins folder. Upon opening SketchUp, it loads all Ruby scripts located in that folder, and provided there are no problems, voilà! You have extended functionality. I have a list of favorite Ruby scripts that I have added to my SketchUp Plugins folder which I will share with you toward the end of this article. But one in particular bridges SketchUp and CutList Plus; CutList 4.0 is the focus of this post. 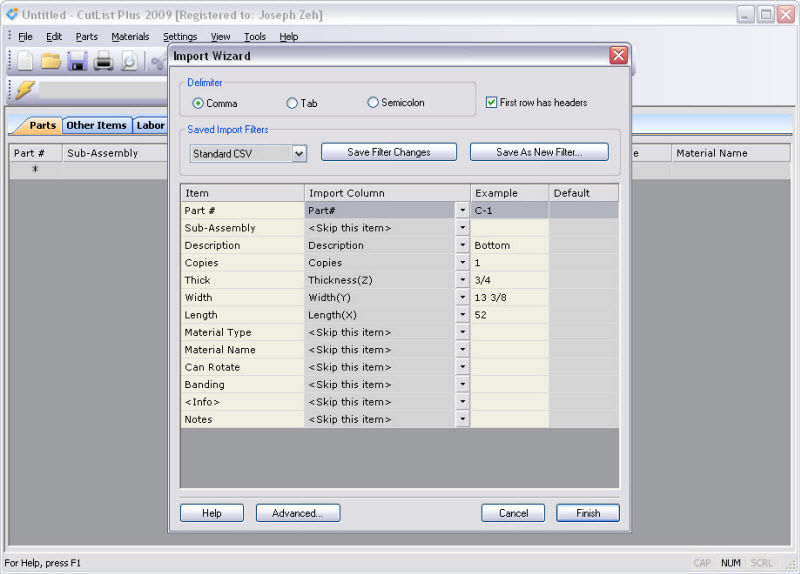 If you use SketchUp and CutList Plus this post is for you. If you don’t use one or both applications you should look into them. SketchUp 6 is a free 3D drawing application from Google. That’s right, free! You can download it by going to http://sketchup.google.com/. CutList Plus must be purchased, but it is not expensive, and it is well worth the price. There are several editions (Silver, Gold & Platinum) that range from $89.00 to $499.00, and serve the casual user to the professional. The Silver version is limited to 50 parts, but that is enough to handle most furniture pieces. My Six Pane Oak Hutch has 35 pieces. If you need more you can break a design down into sub-assemblies. Go to http://cutlistplus.com/ to read about the differences between these editions. The Ruby script CutList 4.0 is free and can be downloaded by going to http://steveracz.com/joomla/content/view/45/1/. This is a zip file and must be extracted to the appropriate SketchUp Plugins folder. In the case of WindowsXP that folder is C:\Program Files\Google\Google SketchUp 6\Plugins. For MAC or other operating systems check your SketchUp documentation. 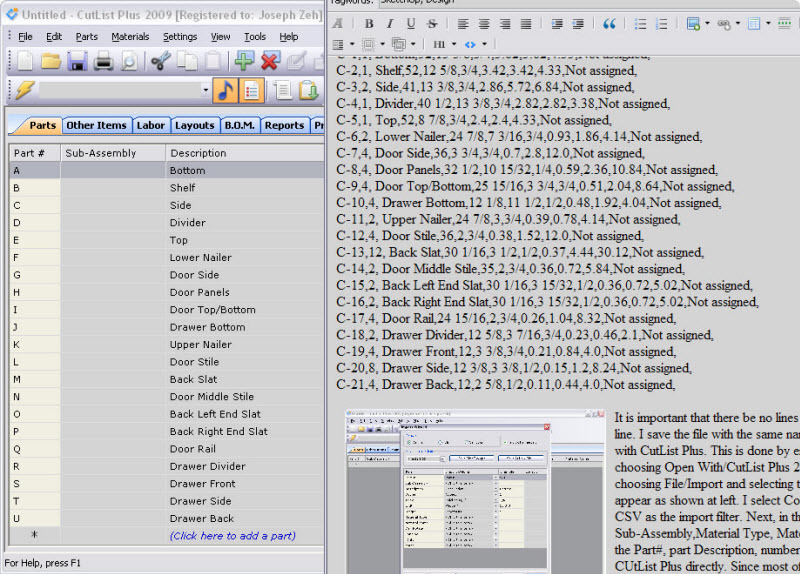 If you like a totally free solution CutList 4.0 will connect SketchUp with Microsoft Excel to produce a cut list using comma separated value files (.csv). 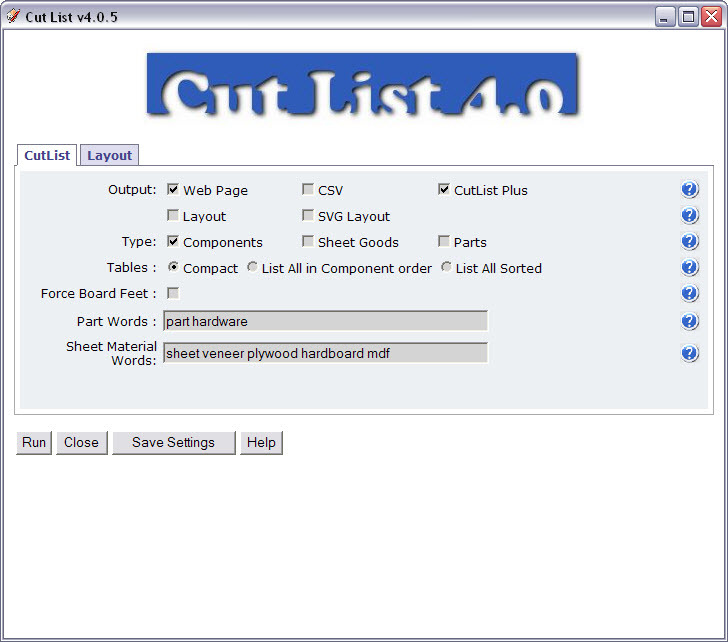 But CutList Plus has many more features that are useful to the woodworker besides a cut list, for example, a layout showing you haw to cut sheet material to get the most efficient and least expensive solution. Once the zip file has been extracted to the Plugins folder you can open SketchUp and you will notice a new Menu item called Plugins. Under Plugins you will see a submenu called Cut List. This is what you would click to produce a cut list file. However, I am going to throw you a curve ball. Then I am going to explain it so that you can work around it or use it. Each time you install a Ruby script in SketchUp a menu item(s) is added. It is generally added to a menu called Plugins. If Plugins doesn’t exist yet, the first Ruby script you add will create it and all future Ruby scripts will use it. The idea here is that Ruby scripts are added features that are not part of the SketchUp application and therefore one shouldn’t mix their Ruby menu items with native SketchUp menu items. I don’t like this strategy because after you have added a number of scripts and used SketchUp for a while you forget which commands (or submenu items) are native, and therefore should look in the related menu, and which are extended functionality and therefore are found under Plugins. So for every script I add I modify the source file slightly to put the command (submenu item) under the appropriate menu. In the case of Cut List 4.0 I chose to put the submenu item under the File menu instead of the Plugins menu. My rationale is that producing a cut list file is a File operation, not and Edit or View or Tools operation. This helps me to remember down the road where to find the command to produce a cut list. Further I changed the command name from Cut List to Generate Cut List. This is slightly more descriptive and it also makes the command stand out a little more so it is easier to locate. I will now tell you how to make this modification if you choose to do so. It does not require programming knowledge, but if you look closely at the changes you will likely figure out what you would need to do to modify other scripts to change menu location. If you choose not to make it then simply remember when I say go to File/Generate Cut List (or something similar) you should read it as go to Plugins/Cut List. To make the modification locate a file called CutListAndMaterials.rb in your Plugins folder (C:\Program Files\Google\Google SketchUp 6\Plugins for WindowsXP). Open this file using Notepad. WordPad may be used if you are careful to save the file without adding formatting symbols. Do not use Word. Word adds formatting symbols. Also be sure to save the file after modification with the .rb extension, not a .txt or other extension. While the file is open scroll to the bottom and locate the following text. Replace this block of text with the following text. Now for an example of how Cut List 4.0 bridges SketchUp and CutList Plus. I have just begun work on a Wall Hanging Hand Tool Cabinet described in previous posts. My SketchUp drawing or model is complete including all dimensions. 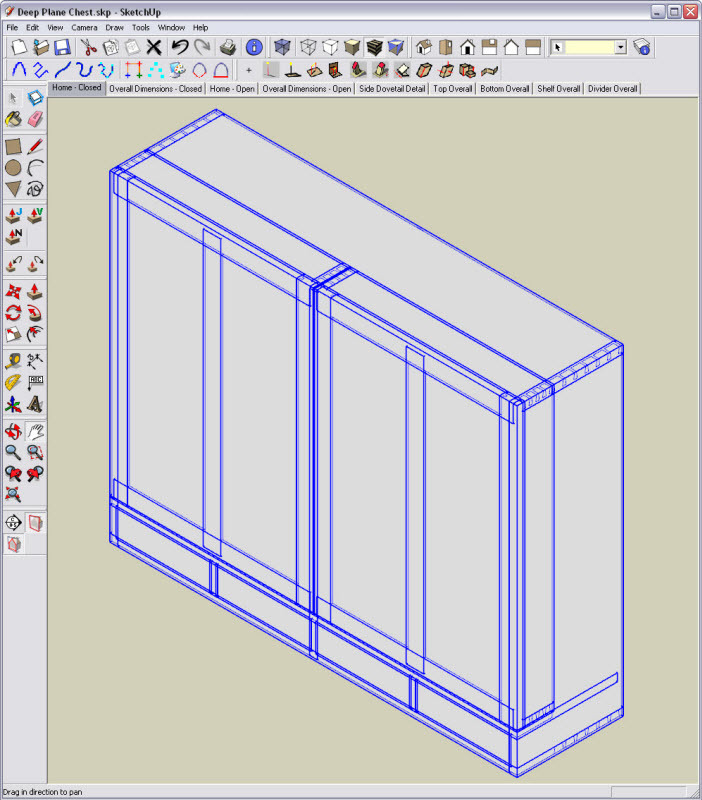 It is not necessary to have all parts dimensioned, but it is necessary that all parts be fully defined components or component instances (instances are components used more than once, for example multiple drawer fronts). I will not describe how to create SketchUp drawings and models in this post; I have a separate multipart tutorial on my blog site for just that purpose. To create a cut list bring up a complete model without dimensions showing and select the entire model. See the picture at left above showing how I did this for my tool cabinet. I select the File/Generate Cut List command (or Plugins/Cut List for you wimps), and left click. A menu selection page appears. With the CutList tab selected make the selections shown in the picture at right above. My tool cabinet is made of all rough cut hardwood so I have chosen to not select Layout. If some of my parts were sheet material such as plywood I could select Layout and get a visual cut list layout. However, even if I did have sheet goods I would ignore the Layout option because CutList Plus has more powerful features to deal with sheet goods. Notice in the picture at right the keywords part, hardware, sheet, veneer, plywood, hardboard and mdf. These are keywords that indicate a component is either a sheet material or a part and not a component. Do not use any of these keywords, or words containing them, when naming your components. 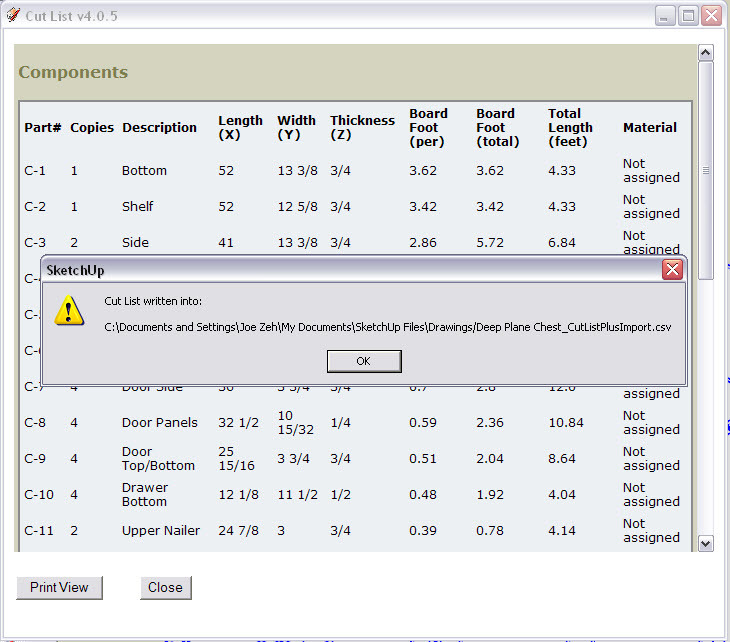 If you do, those components will not be included in the Component cut list. I called one component a Drawer Partition and it was eliminated by CutList 4.0 because part is contained in partition. I had to rename it divider. I simply check Web Page, CutList Plus and Components in the menu selection page. You may wish to left click the Save Settings button to save these selections as I did. Clicking Run produced the message shown at right. This message lets me know where CutList 4.0 saved my .csv file containing the data CutList Plus will need to generate the cut list. I click OK and I can now see the Web Page view of a cut list. I just use this view as a check to be sure all components were picked up correctly. Though I don’t examine it in detail I look for any glaring or outstanding problems. The detail checks I leave until I have a CutList Plus cut list. Remembering where the .csv file was stored (hint: it is likely in the same folder as the SketchUp model that produced it) I open it with Notepad. There is just a little editing required. My file looks as follows. Notice that the first line is "Components". I need to eliminate the first line altogether. I also eliminate the non-Part# lines at the end. The file now looks like the following. It is important that there be no lines or characters before the first heading line. I save the file with the same name and extension. Next I open this file with CutList Plus. This is done by either right clicking on the file name and choosing Open With/CutList Plus 2009, or opening CutList Plus and choosing File/Import and selecting the saved .csv file. A menu page will appear as shown at left. I select Comma as the Delimiter, Standard CSV as the import filter and check "First row has headers". Next, in the import column in each row I use the drop down box to match up the columns. Note for Sub-Assembly, Material Type, Material Name, Can Rotate, Banding, <Info> and Notes I choose <Skip this item>. All I want is the Part#, part Description, number of Copies, and the three dimensions. The rest of the information I can deal with better in CutList Plus directly. Since most of my cut lists will be similar I left click Save Filter Changes to save these selections. Then I click Finish. By the way, if I had left any characters or lines before the heading line while editing the .csv file, heading names would not appear in the drop down menus for each row. An Import Results message pops up indicating that 21 components were imported and 1 blank line was ignored. The blank line is a result of leaving a carriage return after the last part in the .csv file. Careful editing of the .csv file would eliminate this. The 21 components agrees with the number of components in my In Model components library of my SketchUp model. This is not the number of total parts, since a number of components are used numerous times. I click OK and my raw CutList Plus cut list appears as shown at left. At this point I have an Untitled file name, no sub-assembly information, Sheet Goods for the Material Type and Not Specified for the Material Name. These are easily edited and corrected in CutList Plus. In fact I can edit the Material Name and Material Type as one group and I can save the file with whatever name I please – though I always give it the same name as the SketchUp model itself. The final cut list is shown at right. I am not going to discuss how to use CutList Plus in this post. I will reserve that for the future since it deserves its own post. Suffice it to say that CutList Plus is rich and powerful. 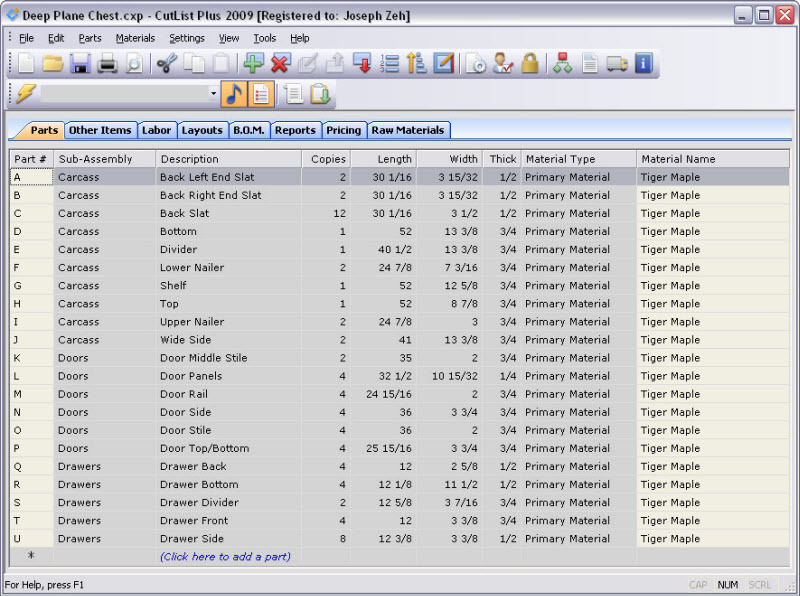 In addition to a cut list it can produce a Bill of Materials, Project Proposals, Cost Sheets including labor and other parts such as drawer pulls, sheet cutting Layouts, manage inventory and much, much more. You can download a 30 day trial version and give it a whirl. The learning curve is short, so have fun.